Yiu-kwong Chung (鍾耀光) is one of Taiwan's best known and most sought after composers. He has written concerti for numerous top-class soloists including percussionist Evelyn Glennie, trombonist Christian Lindberg, saxophonist Claude Delangle, cellists Mischa Maisky and Anssi Karttunen, flutists Pierre-Yves Artaud and Sharon Bezaly, in addition to renowned Kronos Quartet. 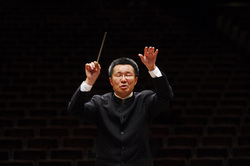 During his tenure as General Director of the Taipei Chinese Orchestra from 2007 to 2015, he has produced 6 CD’s available worldwide by Swedish BIS Records. 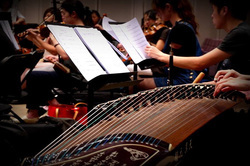 He currently teaches percussion and contemporary music at the National Taiwan University of Arts. 13+17+19+23+29 Fantasie Brillante for Erhu and Chinese Orchestra (Piano Reduction and Study Score) are now available for digital download, please visit MUSIC STORE. Whirling Dance for Flute and Chinese Orchestra (Piano Reduction, Study Score, Complete Orchestral Set) are now available for digital download, please visit MUSIC STORE. Sunlight after Snowfall Concerto for Erhu and Chinese Orchestra (Piano Reduction and Study Score) is now available for digital download, please visit MUSIC STORE. Cursing General Cao Cao for Trombone and Chinese Orchestra (Complete Orchestral Set) is now available for digital download, please visit MUSIC STORE. Music for Gourd for Sheng and Chinese Orchestra (Piano Reduction) is now available for digital download, please visit MUSIC STORE. Concerto for Alto Saxophone and Wind Ensemble (Piano Reduction) is now available for digital download, please visit MUSIC STORE. Concerto for Percussion and Orchestra (Piano Reduction) is now available for digital download, please visit MUSIC STORE. Cursing General Cao Cao for Trombone and Chinese Orchestra (Piano Reduction) is now available for digital download, please visit MUSIC STORE. Mongolian Fantasy for Trombone and Chinese Orchestra (Piano Reduction) is now available for digital download, please visit MUSIC STORE. "Dark chapter of Taiwan history memorialized in music"
"Matchups - A Profile of Chung Yiu-kwong"